There was something that I wanted to do for a long time, but never did it. Now I can say I did. 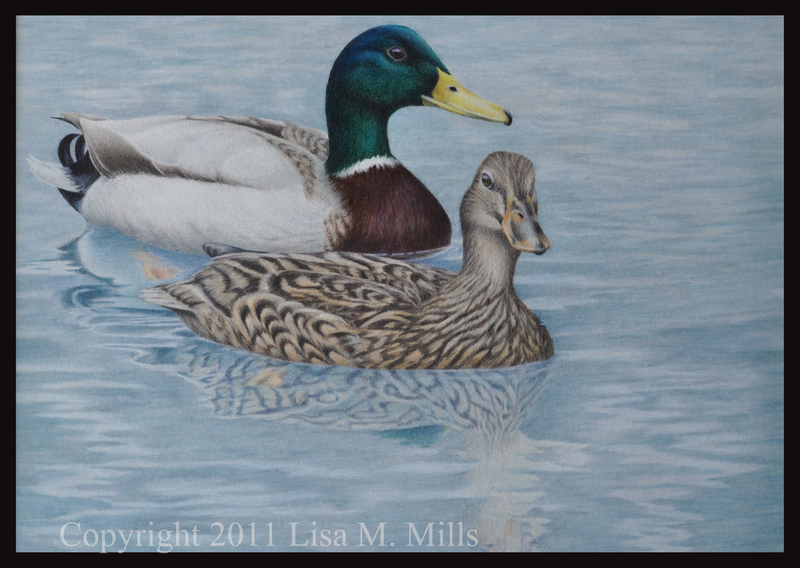 I finally entered the Federal Duck Stamp Contest, an annual competition for artists (mainly wildlife artists participate) through the U. S. Fish and Wildlife Service. The competition supports waterfowl and wetlands conservation and has been held since 1934. Though I don’t focus all of my artwork on waterfowl, I do like to illustrate birds along with wild and domestic animals. I was convinced more than ever that I needed to enter this contest when a pair of Mallards landed in my pool in February, 2010 and proceeded to take up residence for the following few months. What resulted was a clutch of 11 eggs, 7 of which hatched and we were all proud parents of 7 baby Mallards. After the young birds were about 6 or 7 weeks old, we had us an old-fashioned duck roundup and gathered the babies and took them to the park, about a quarter of a mile away. There are turtles in the park, who are predators to the very young ducklings, and we wanted to make sure they had a fighting chance before releasing them to the pond. The hen followed us all the way to the park as we walked along carrying the babies in our recycle bin, covered with a screen since they could hop out. Picture the Aflac duck squawking all the way behind us, and this is what Mama sounded like, frantic over where we were taking her kids! I’m sure we looked crazy. I don’t believe all seven survived, as I went back for the next week to check on them and at last visit only saw four. I couldn’t stand it after that, and quit going. I was amazed at how emotionally invested I became in this family of birds. While that isn’t exactly what wildlife conservation is all about, in our suburban circumstance, it became a mission to help those ducklings along. The Mallard is a migratory species and really shouldn’t remain here through the summers. They’ve become almost domesticated as they live in parks and are subject to stay since humans feed them. The same story goes for some Canada Geese that remain in this god-awful Texas heat instead of traveling north to endure a more comfortable summer. You can read more about conservation at the Fish & Wildlife Service website and at the Ducks Unlimited website as well. So I had all the inspiration and hundreds of photos to launch into the duck stamp artwork. Artists are limited to simple compositions that allow printing along two edges for the actual stamp. Their selected species must be anatomically accurate and accurate to the time of year depicted in the drawing. (Ducks coloring changes due to seasonal differences – such as mating plumage and eclipse plumage.) For example, you cannot illustrate a Mallard in breeding plumage and depict a fall setting – they breed in the spring. The species artists can choose are limited to 5 species of ducks and some geese. The selection changes each year. 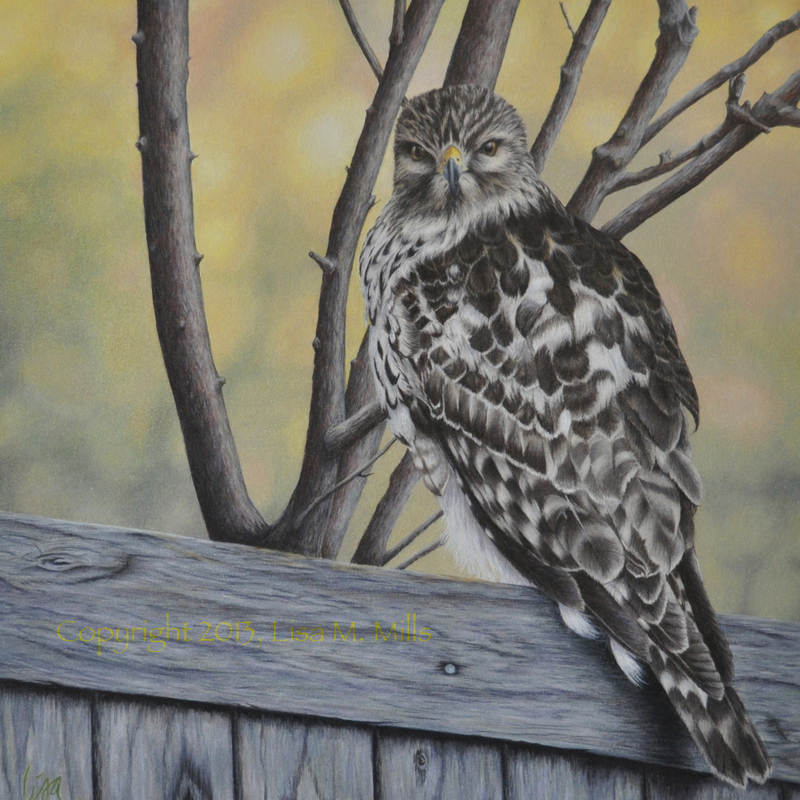 The piece is off to the USFWS tomorrow…we’ll see what the judges think. I’m way inexperienced compared with the other artists that win this annually, but I’m glad I’ve at least finished the project and can say I’ve done it! Quack, quack. About a year ago, I decided I wanted to venture back into art, mainly just as a hobby or a way to create art for my house. 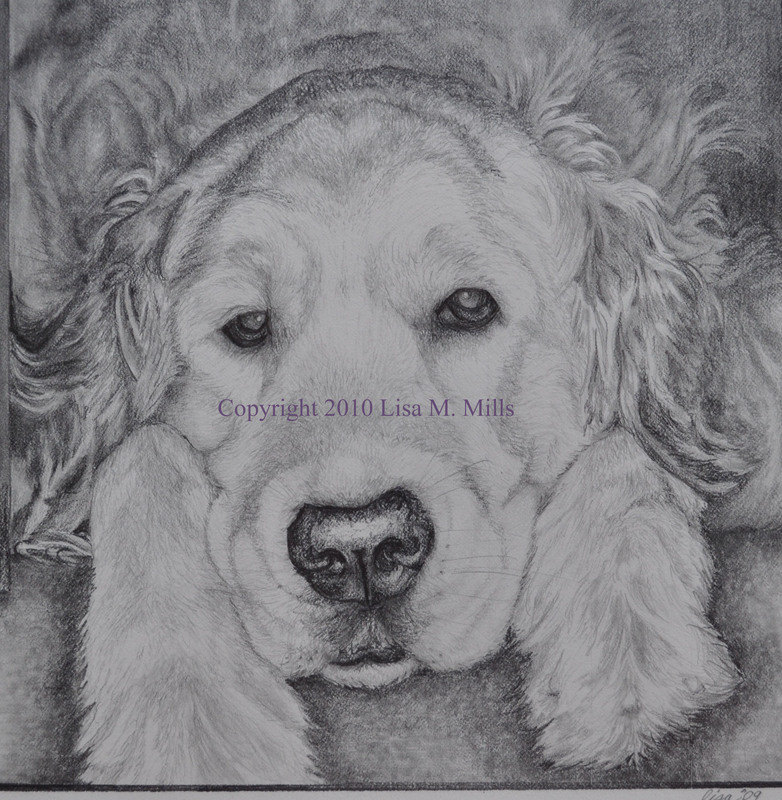 I started with my graphite pencils and illustrated a drawing of Lucy, my Golden Retriever. This rendering of Lucy depicts her on her favorite perch – the stairs. She was unmoved that I was photographing her and moved even less that I illustrated her. She’s a lazy girl. That one drawing got me hooked all over again on art (you can see my story on the “About the Artist” page). 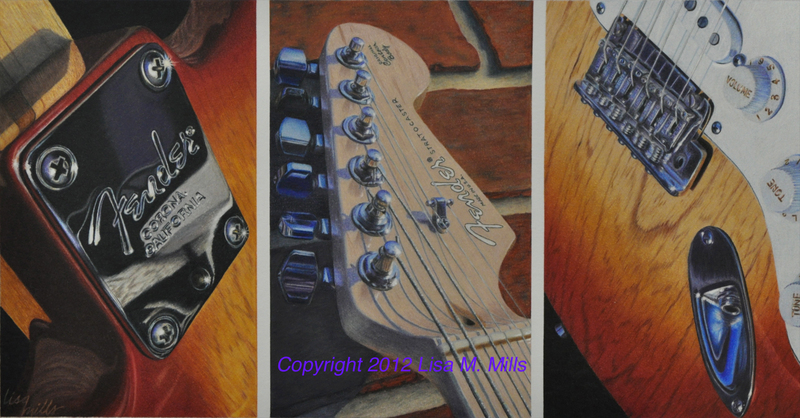 I then began to photograph my dogs, birds, critters in the yard – virtually anything I could draw. I’m slow at my craft, but steady as I rebuild a portfolio. Last spring, I discovered another artist named Alyona Nickelsen who has a book called “The Colored Pencil Painting Bible.” Wow. She is amazing. I found out she offers an online school and I thought this would be a great way to hone my skills as an artist. I took Part 1 in September and will be starting Part 2 in November. My husband suggested I was going “out of my gourd” while I was working on it as it was so intricate. But I persevered and won the Class Challenge Project (this gourd) for Part 1 of the class. (Each class has a challenge project at the completion of the class, where students are encouraged to submit their work to compete against one another.) 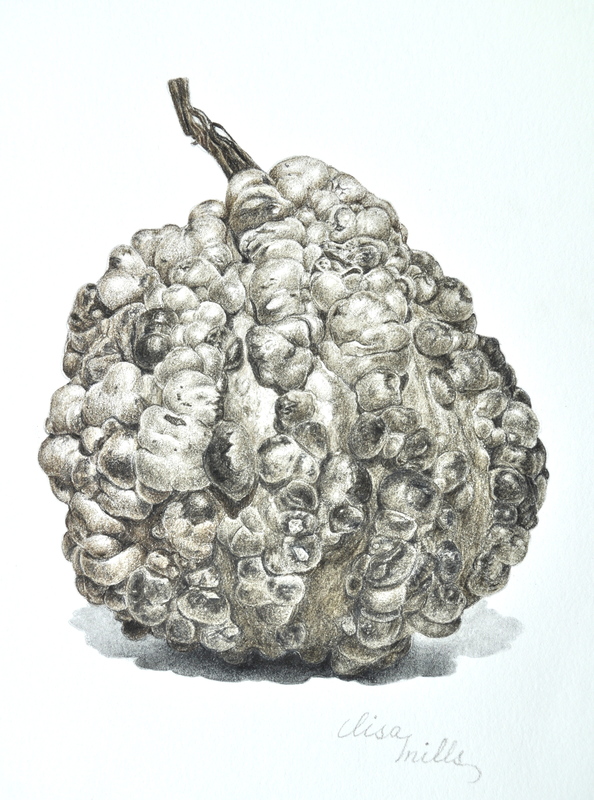 This was rendered in sepia, plus black colored pencil and a colorless blender. So, thanks for stopping by Color Me Here…I’m looking forward to the journey.